You’ve made your way through the first four steps of the audit cycle – now all that’s left to do is review the audit report and submit! For California charters, these last two steps occur in November and December. An audit report contains 14 sections. See the chart below for a summary of the information included in each section, as well as why each section is important. While all sections of the report contain useful information, the most revealing is the Audit Year Findings section, where the auditor addresses issues identified throughout the auditing process that represent a deficiency in the charter school’s internal controls. There are two types of findings – a material weakness, which is the most severe finding; and a significant deficiency, which represents a less severe finding but still warrants flagging and correction. The auditor’s findings outline what the charter school did or did not do that was incorrect or improper, as well as the generally accepted expectation for what the school should have done. The findings also provide detail around the impact of the deficiencies on the school’s financial statements, as well as recommendations for what school leadership should do to resolve these issues. 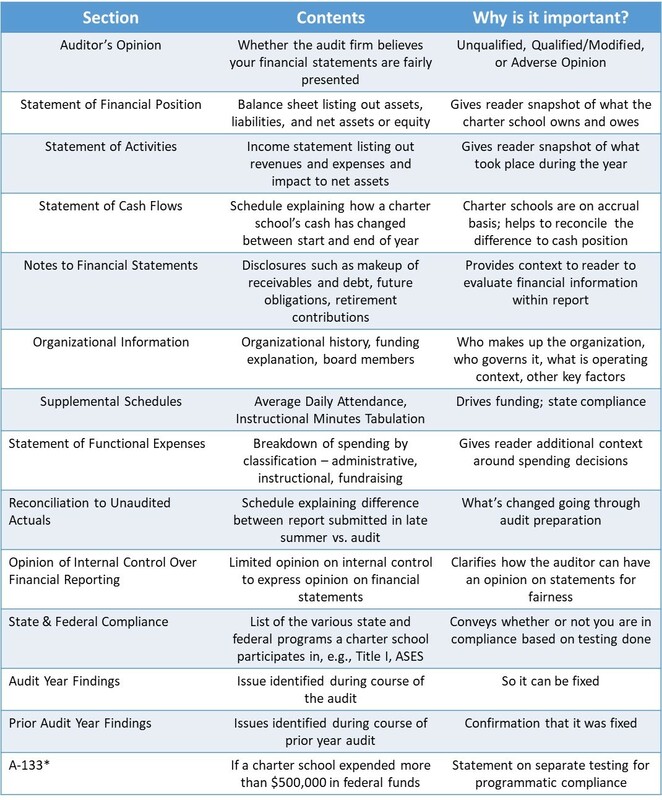 Common audit findings for charter schools include inadequate resourcing or tagging of restricted fund activity; missing documentation such as credit card receipts; lack of adherence to purchase or approval policies and thresholds; untimely deposition of funds; improper capitalization of assets; and compliance issues. It is important for school leadership to review the audit report for accuracy of information, as well as to make sure they understand all findings. For example, were the findings a result of a lack of adequate policies in place, or rather a staff violation of existing policies? Then, staff must prepare a response acknowledging or contesting the findings. The response should provide additional context and/or an outline of corrective action to be taken, where appropriate. Perhaps the school plans to draft revised purchasing policies or increase education and training to make sure all staff understand the current policies. This response is typically prepared by the school’s business office staff, who may find it helpful to reach out to their back-office services provider for assistance with explaining previous actions, as well as with implementing new policies and processes designed to help prevent future findings. Some responses may also require consultation with legal counsel. Once complete, the response should be reviewed by the charter school board before submission to the auditor. Once the board has reviewed the response and has signed off on the rest of the audit report, the auditor will submit a final report to the designated authority. Audit reports for California charters must be submitted to the California Department of Education by December 15. What is our total value proposition? How competitive do we want/need to be? Where are we in our growth cycle? What is it that we want to reward in this organization? How do we balance paying competitive market rates with maintaining internal equity? 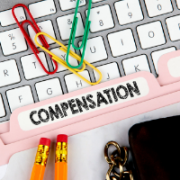 To create a market-based compensation structure, you’ll need to understand where you stand relative to the market, which depending on your organization may include the local school district, similar organizations, as well as other nonprofits, public agencies, and even companies who might be competing with your organization for talent in key roles. Wherever possible, stick to comparisons with your own organization’s industry, mission, geography, and budget/staff size. Try to use at least three sources to ensure that the data is sound. At Edgility, we are wary of sites like Glassdoor and Payscale, who sometimes report salaries for jobs based on a very small sample size. We prefer specialized databases like CompAnalyst, which is updated monthly to keep up with fluctuations in the market and covers more than 4,000 benchmark jobs gathered from comprehensive employer surveys. Pay grades or levels, in which similar jobs are grouped together. For example, an entry-level data associate, a reception clerk, and a paraprofessional might all be included in the same grade, with the averages of their market salaries used as the midpoint for that grade, or you might group all principals or program managers in the same grade. Pay ranges or salary spans within those grades or for each role — according to ZipRecruiter, the range typically extends 30% range of the midpoint or average market salary for a junior or support role, 40% for mid-level management, and 50% for executives. New hires tend to earn around the middle of that range, and experienced top performers earn 80-100%. For particularly large or complex organizations, pay schedules may be created, which vary by business line (in the case of a school organization, this may vary between school sites and the central office) or by location based on the cost of living and competitor salaries in that market. For example, the National Center for Montessori in the Public Sector suggests this starting point salary schedule for teachers in public Montessori charter schools, along with benefits, 2% yearly step increases, periodic retention bonuses, and stipends for taking on additional responsibilities. Finally, map current jobs and salaries against the new structure to determine whether your new compensation structure matches existing pay, including whether there is equity across levels, roles, and other characteristics. You’ll get an immediate sense of whether there is equity across the organization, and whether there are adjustments that need to be made. 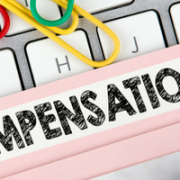 Organizations that take a strategic, research-based approach to compensation find that new employee salaries are easier to set, and that existing employees feel more properly valued and compensated. “Compensation analysis helped us determine highly beneficial changes that are attracting and retaining top talent,” agrees Margaret Winnen, Director of HR & Talent Development for College Track. At Compass Charter Schools, Superintendent & CEO J.J. Lewis says his team recently shared a new compensation structure and benefits package with staff, who were pleased that salaries will now account for past teaching experience. Teachers and non-instructional staff will also receive bonuses tied to criteria like workload, enrollment, and student performance. Over time, happy and appropriately compensated employees translate into less turnover, more stability, and greater productivity — an effort we think is well worth the cost. Allison Wyatt is a founding partner at Edgility Consulting, which finds the leaders that education organizations need to make a difference. Prior to launching Edgility, Allison built and scaled a human capital consulting practice at a national retained executive search firm. In addition, she has served as the vice president of human capital for Education Pioneers. In our last blog post, we covered the first two phases of the audit cycle: Auditor Solicitation and Auditor Engagement. In this post, we’ll take a deeper dive into the third phase, the Pre-Audit. This phase occurs between April and June, and involves the auditor’s first visit to the school and frequent communication between the auditor and school leaders. Once your charter school board has selected an auditor, the first step will be working with the auditor to establish a timeline for the final report. Keep in mind that you’ll want to leave enough time to conduct a thorough review of the audit report, so the earlier you can begin the pre-audit, the better. During the pre-audit phase, it’s important to ask questions as they come up. Remember, your auditor is a resource, not an adversary, and they want a clean audit just as much as you do. The pre-audit phase is designed to prepare the school for the main audit, so now is the time to clear up any confusion about the process, test internal controls and compliance, and remediate any issues before the end of the fiscal year. 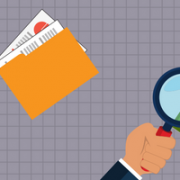 As you prepare for the auditor’s first visit, there are a few things you’ll want to get in order so the visit runs smoothly. It is helpful to have reviewed the segregation of financial duties, prepare an explanation for significant or complex transactions, and gather key documents. These documents include internal controls policies and procedures, paperwork related to pending legal matters, as well as copies of significant transaction such as leases and loans, new contracts with service providers, and new grant agreements. Your auditor may also ask for financial documents such as trail balances and check registers. Whenever possible, provide your auditor with electronic documentation to keep everything organized, and try to fulfill their requests in a timely manner to avoid delays; remember, delays now mean you will have to rush during the main audit phase later. If you have any concerns about being able to produce certain documents, share them with your auditor as soon as possible so you can work together toward a solution. Lastly, remember to share major new developments with your auditor as they occur; your auditor will need to know about plans to open a new school or take out new loans, or expectations of new funding sources, as this will impact your school’s financial situation. Once it’s time for the actual visit, make sure you set aside ample time to meet with the auditors to provide an overview of the school’s operations and review their questions about the school’s policies and procedures. This will set the stage for a smooth and efficient visit. The pre-audit phase is designed to prepare your school for a successful main audit. Treat your auditor like a true partner; don’t hold back any information, be clear and timely in your communication, be open to suggestions regarding how to improve processes, and ask questions as they come up! And stay tuned for our next blog post about the next phase of the audit cycle, the Main Audit! An audit is an official, independent review of your charter school’s financial statements by an approved CPA. An annual audit is required of charters in most states. There is much preparation required before the annual audit. The timeline below breaks up the charter school audit cycle into multiple phases and includes suggested dates. In today’s blog post, we’re going to focus on the first and second phases: Auditor Solicitation, which all schools should ideally start preparing for in September, and Auditor Engagement, which should be completed by April 1. If you’re not there yet, there’s still time – but you should start now! Charter schools must select an auditing firm at a publicly noticed board meeting, and contract with the selected audit firm by April 1 of the current fiscal year (e.g. you need to select an audit firm for the fiscal year ending June 30, 2018 by April 1, 2018). Before this can be done, a charter school’s board must issue a request for proposal (RFP) from auditing firms. You can find sample RFPs for audit services online, or ask your local charter schools association or peers at other charter schools. A school’s letter to auditors should include the school’s legal name, address, and contact person; years of operation of the school; history of prior audits; status of 501c (3) application; fiscal year to be reviewed; enrollment and ADA data for fiscal year to be reviewed; if the school is site-based or independent study; if federal expenditures will exceed $750K; if the school also requests tax filing services. Remember that you should only reach out to auditors listed on your authorizer’s approved vendor list. You might want to ask peers at other charter schools for auditor recommendations, as this can be helpful advice. Once you have proposals in hand, it’s time to bring them to the board for review and voting action. There are a few key qualities that are important for board members to look for in an audit firm. Preferably, the auditing firm will have experience working with charter schools and understand how they operate; if your school is in its first year of operations, you’ll want to work with a firm that has experience working with first-year charters. An ideal firm will also be responsive to questions and proposal requests, as this is an indication that there will be good communication during the auditing process when pressing questions arise and the school requests feedback and support. It’s also important to select a firm that seems to have a reasonable, fair mentality. Many districts and county offices of education require some sort of notification of the selected audit firm, along with cost information and certification that the firm is authorized to conduct school audits, and some may require notification prior to April 1, so be sure to check with your authorizer. And be on the lookout for our upcoming blog post about the third phase of the audit cycle, the Pre-Audit! 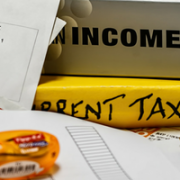 Tax Season Is Coming…Get the 411 on 1099s! Any vendor that is paid to provide services to your school could be eligible to pay taxes on 1099 income. As a best practice, get in the habit of requesting W-9’s from all your vendors when you start working with them, so you have the information you need to issue 1099s when the time comes. Start reviewing your vendor list now so you’re not scrambling to meet the January 31 deadline! If your charter school leases its facilities, the rent expenses may be reported on a 1099 Form. If you’re not sure if you need to submit a 1099 for a certain vendor, just go ahead and submit it. The IRS will know whether a vendor is eligible. It’s better to be safe than sorry. The due date for submitting 1099s to vendors and to the IRS is January 31st, but don’t wait until then. If you’re done at the beginning of January, submit! Corrections can be made through the end of March. https://edtec.com/wp-content/uploads/2019/01/1099-Blog-Post.png 200 760 zenden https://edtec.com/wp-content/uploads/2018/07/edtec-logo-300x135.png zenden2017-11-29 09:50:322019-01-17 23:39:54Tax Season Is Coming...Get the 411 on 1099s! Now that your 2017-18 budget is approved, it’s time to start preparing for the upcoming school year. 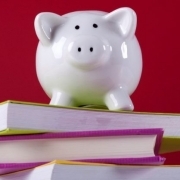 The (slightly) less hectic summer months are a good time to review the school’s financial policies and procedures to make sure everything is in place. With that in mind, here are a few thoughts about one very important topic in this area: payment methods! For many of our clients across the country, we see the same problems around navigating how to pay for supplies and services: school leaders want to be nimble and responsive to their team, but they also worry about managing the budget and following policies and procedures for the audit. Not an easy task! While there are reasons and occasions to use each of these, I strongly recommend using the invoice (and PO, if you have a PO process) and paying by check as often as possible! Because a well-run invoice and check process is centralized through your business staff, the ostensible drawback is that you are strictly controlling and slowing down the purchasing of materials and services. This may feel limiting to people! One way you can address this is to keep a regular weekly schedule of ordering and negotiate fast shipment times with your vendors. Another method can be purchasing portals like Staples.com or ClassWallet.com or purchasing systems like Procurify, which can allow individuals to order through a single source and follow the approval process. Debit card: if you have a school credit card, almost nothing. The reason is that debit cards take money directly out of your account, potentially bypassing internal authorization and increasing the risk of missing documentation. If you don’t have a school credit card, then see the “credit card” section below for some reasons you might need your debit card. Credit card: ah, a necessary evil! Let’s talk about this in greater length . . .
Who will have a school credit card? Keep this limited, perhaps only the office manager, executive director, and/or principals. Note that it’s likely that either the cardholder or someone else at the school will need to personally guarantee the card. It’s difficult for charters to get small business cards that do not require a guarantee. What can be purchased on the credit card? Keep this limited as well, for example: travel expenses, team appreciation dinners, conference fees, specialty supplies (can be a slippery slope, so be careful!). What cannot be purchased on the credit card? Make this list robust to show you’re serious, for example: curriculum, books, school supplies, computer equipment or technology, field trip entry fees, yearbook vendor fees, refills on postage meter. How will credit card owners document purchases? Several best practices are: require all receipts to be submitted within one week of the close of the CC statement; outline consequences if documentation isn’t provided (e.g., CC usage suspended until receipts submitted); ensure that purchases of a certain level are pre-authorized; and ensure CC statements are reviewed by a supervisor (note: make sure your most senior school leader has a member of the board reviewing and signing off on his or her CC statements monthly). One final take-away for your financial operations – It’s ok to make purchasing and payment a little inconvenient! The slight inconvenience will help ensure that you are conscious of your spending, you are staying in line with your budget, and you have everything you need when it comes time for your annual audit. It’s June, and many charter schools are scrambling to put the finishing touches on their charter school budgets for the 2017–18 school year. This can be frustrating and overwhelming given all the moving parts —finalizing staff compensation, collecting final proposals for next year’s contracts, deciding which software and curriculum to use, tracking down charter school budget plans from all the department leads, and of course, the state budget revisions… all while trying to finish out the school year! 1. Pick two or three areas of the charter school budget you’re going to focus on in the 11th hour. These should be areas of the charter school budget that are either your most significant sources of revenue or expense, or have caused problems in the past. And don’t pick “staff”! (See my next suggestion below for wrapping up your compensation budget.) Once you have picked your areas of focus, set aside a designated time (~30 minutes for each area) to dig in and try to firm up the assumptions — then put a bow on it! Once the year starts, and you have more information, you can work with your Finance Director or adviser to adjust the annual forecast to include all your latest knowledge and assumptions. 2. For staffing, again — do your best! Finalize the charter school budget with the information you know now, and include reasonable and conservative assumptions for the things you don’t know. At some point, you have to stop trying to get everything locked up and just go with what you have. But being conservative will help you avoid the frustration of going over budget down the road. 3. Make a list of the areas where you feel assumptions aren’t solid, and over the summer, push to solidify them. Also, be upfront with your board about the areas of uncertainty (note: no need to share every uncertainty, just the ones you feel are the biggest opportunities/risks). I find that outlining the missing information at a high level actually strengthens the board’s comfort with the financial plan. The board members will appreciate the transparency and feel reassured knowing you are aware of the uncertainties and on top of all the moving parts. For most charter schools, budgeting is an art, not a science. There are countless details, many of them unknown or unknowable, so we just do our best with what we have and keep pushing for improved clarity as the year goes on! Here at EdTec, we have the fortune of working with many school leaders, both seasoned and new to the charter world, which allows us to see the most effective school leadership practices. Many new school leaders have brought successful strategies implemented in their classrooms to their new roles as executive directors. Inevitably, however, there are aspects of managing a school that fall outside the comfort zones of school leaders and board members, such as finance and operations. 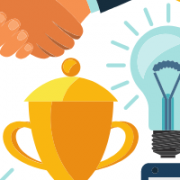 While most grow to develop skill sets in these areas, it can take time to develop those skill sets, and for those brand new school leaders, going into the job with the full knowledge base required to successfully run a charter can feel impossible. But there is hope! This article highlights questions that routinely come up from directors who have had to adapt to the unfamiliar financial and operational demands of their position. What key concepts do I need to know to monitor my school’s financial position? Balance Sheet vs. Income Statement: In financial accounting, the balance sheet and income statement are the two most important types of financial statements. A balance sheet lists the assets and liabilities of the school as of a certain date. These may include receivables and payables (see accruals below). An income statement, also called a profit and loss (P&L) statement, is a report for revenues and expenses over a specific time period, usually a fiscal year. Operating Income: The most basic financial indicator you will need to monitor on an ongoing basis is your school’s operating income, which is derived from the income statement. This figure is simply the amount of revenues received minus the amount of expenses your school incurs in a given fiscal year. In the business world, “operating income” and “operating profit” are often used interchangeably. Depreciation: It’s also important to understand the effect that depreciation will have on your school’s operating income. Depreciation is a method of allocating the cost of a tangible asset over its useful life. If your school purchases technology for $10K that has a useful life of five years, $2K of that expense will be realized each year over the course of those five years. This means that the operating income may only be reduced by $2K each year for accounting purposes, but the full $10K still had to come out of the school’s checking account at the time of purchase. Fund Balance vs. Cash Balance: The fund balance is the net worth or equity of the school. This is measured by its total assets (all that the school owns that has a monetary value and enhances its worth) minus its total liabilities (all that the school owes in debts and obligations). In other words, it is the net amount of money the school has accumulated over its lifetime (the sum of each year’s operating income since inception). The fund balance is a good indication of the long-term financial health of a school. Similar sounding, but distinct, is the cash balance: the amount of cash the school has in the bank at a given time. Keep in mind that your fund balance will likely not equal your cash balance, because your fund balance represents all of your assets, not just cash. Assets include cash and any payables or receivables, or land and equipment that is being depreciated. When examining a cash flow statement, the projected cash balances indicate whether your school can meet its obligations on time. If that balance is positive, you will be able to pay your bills and employees on time; if it is negative, you will not, and will need to figure out a way to manage those shortfalls through negotiating with vendors or borrowing money. Accruals: Accrued expenses are liabilities which are recognized on your books before they are paid for, while accrued revenues are assets which are recognized on your books before they are received. Remember, accruals are a big reason for the difference between fund balance and cash balance. Depending on the accounting system your school uses, accruals can be booked differently. Despite the differences, however, it’s essential to know that at the end of each fiscal year, there will be a significant percentage of current year funds that the school is still owed, but those funds won’t actually be received until the following fiscal year. Accruals are those amounts that are still remaining past June 30 that count as current year revenue even though they aren’t received in the actual current year. The same applies for expenses that are incurred before June 30, but paid out after June 30. What are the big-ticket items to keep in mind when managing this year’s expenses and starting to budget for the next? While you might stress over whether you should budget $5K or $10K for professional development, an additional set of textbooks, or extra office supplies, it is important to remember that these are smaller-scale, discretionary expenses. Other more rigid, bigger-ticket items determine the amount left over for those discretionary items. Taking the time to address the big-ticket items that are within your control well before the start of a new school year will enable you to maximize the amount of funds that remain for day-to-day programmatic expenses, and any extras you can afford. Special Education encroachment costs typically fall somewhere in the wide range of $300-$1,000/ADA if the charter acts as a school of the district for Special Ed purposes. If you are unhappy with the services received for the associated costs, then don’t view this as a set cost in the long term. Evaluate how the district compares to becoming your own LEA and joining a charter SELPA, where you will receive the Special Ed revenues and avoid the district’s encroachment, but will need to provide the Special Ed services to those students in need. Rent costs can vary wildly depending on the terms of your school’s lease. Evaluate whether the school’s current space is serving its needs well. If it is, explore whether there might be room to negotiate lower rent for the coming year. If it isn’t, explore what other options may be available within your area. Additionally, can you request facilities from the district under Prop 39, or can you seek reimbursement for part of your school’s rent through SB 740 or CSFIG? Various services can represent a significant decision point for schools: in-house personnel or outsourced provider? When sourcing services such as food providers, custodial, back-office, or other consultants, hiring in-house is the option that likely affords you the most flexibility. It also requires benefits and employer contributions, as well as the cost of any associated supplies needed to fulfill that service. On the flip side, using an outsourced provider may provide cost savings and may simply be less of a headache, allowing the school to keep a smaller, more streamlined staff focused on the instructional program, while avoiding the hassles and costs of addressing staff turnover in those areas. If pursuing this option, make sure the vendor is competitively priced for the services or service level being offered and can fulfill the specific needs of the school. Examining this year’s budget: Is an operating loss acceptable? How much? You should be making any necessary expense cuts in order to maintain a balanced budget and an operating income that will meet your authorizer’s requirements for minimum reserves. Note that the longer in the year you wait to make cuts to ongoing expenses, the less effective they are in preserving your operating income. Because it is relatively early in the school year, making the hard decisions now will save you headaches later when it is too late to make any fiscally meaningful changes. Cash: What are the cash projections throughout the year? If cash flow looks tight from month-to-month, spending decisions should be determined more by short-term obligations than annual budget considerations. 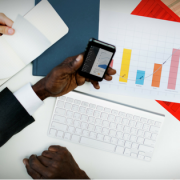 If cash balances are healthy, however, assessing cash flow is not quite as imperative to your overall approach to budgeting. Fund Balance: Has the school accrued substantial reserves from prior years resulting in a positive, strong fund balance? If so, tolerating a loss in this year’s budget will not jeopardize the school’s long-term financial health, if there are essential elements to your program that cannot be sacrificed. However, your school will not be able to sustain this approach for long, as authorizers will want to see fiscally sound, sustainable projections come time for charter renewal. Accepting an operating loss for the year should be an absolute last resort, and only if your school has the fund balance to sustain it. Cash flow financing: How do I evaluate options if my school is in need of cash? How much does the school need to borrow? How long will the school have to repay? What is the interest rate and what other fees (e.g. origination or management) are involved? It’s important to think about the long-term implications of the questions above. Any interest or fees will not only limit the amount you can borrow, but will also decrease your operating income for the year. Additionally, it’s important to think of those fees in annualized terms. If your school will need to pay 5% in fees to borrow money for two months, that would be comparable to a ~34% annual percentage rate (APR). Evaluating options on an annualized percentage basis will also help you weigh multiple borrowing options, as you are then comparing apples-to-apples. Why am I short on cash? Is it a temporary issue, or is it systemic within the school’s financial planning? Does borrowing cash now put me in a position to need to borrow again in the near future? Where in the budget can I make cuts to balance the additional cost of borrowing money? What is my long-term plan to develop cash reserves to reach sustainability? Getting your ducks in a row: What do auditors look for? Contrary to common expectations, auditors do not focus on whether your school is doing a good job. Rather, auditors’ main function is to evaluate whether your school is telling the truth about the job that it’s doing. This means that they assess the accuracy and compliance of your school’s attendance records, financial statements, and some procedural items such as resolutions passed by the board and the financial controls in place at the organization. In the end, auditors make a determination about whether your school is at risk of no longer being a “going concern” (meaning the school is able to continue operations in the foreseeable future), but the bulk of their work is to ensure that your school is fairly stating all financial information. If you are a new school leader, you may be looking for the auditor to tell you that the school is doing a great job. More likely, if things are going well, they will inform you that the school is doing a sufficient job and is in compliance. For example, if things are not going well in the auditors’ eyes, their reason will not be that attendance is too low; instead, their reason may be that attendance is inaccurate according to the reports submitted versus the daily records. The setup and organization of attendance files, documentation of invoices and payments, backup for any deposits made, contracts or MOUs signed for the year, and board agendas/minutes/resolutions are all items that require substantial record-keeping for auditing purposes. Make sure whoever oversees operations at your school is continuously evaluating the compliance of these auditable items throughout the year. Financial management can be challenging even in the best of fiscal times. However, keeping these basics in mind can help you meet those new school year resolutions. And remember – never be afraid to ask for help!